Patiala, 04 Sept, 2015 : On the concluding day of the ‘National Seminar on the theme of ‘Language as a tool to promote National Integration’ organised by Punjabi University Sri Guru Tegh Bahadur National Integration Chair in collaboration with Panchnad Research Institute & Department of Linguistics and Punjabi Lexicography, two noted scholars presented their papers which was followed by discussion. Prof. Paramjit Singh Sidhu of Guru Nanak Dev University, Amritsar stressed the role of regional languages and media for promotion of national integration. Prof. Paramjit Singh Dhingra of Punjab University, Chandigarh, while highlighting the role of bilingualism, lauded the contribution of scholars, philosophers of medieval Punjab. Dr. Suman Preet, HOD Linguistics chaired the session. Earlier, Chair Professor Dr. Baltej Singh Mann in his welcome and introductory remarks said that the national integration has to aim at the integration of an individual with the society and nation in the interest of the welfare and security of the nation at different levels. “It is important to keep in mind the characteristics of multilingual and multicultural India and to have a periodical review of various steps undertaken in the interest of national integration.” Dr. Mann added. 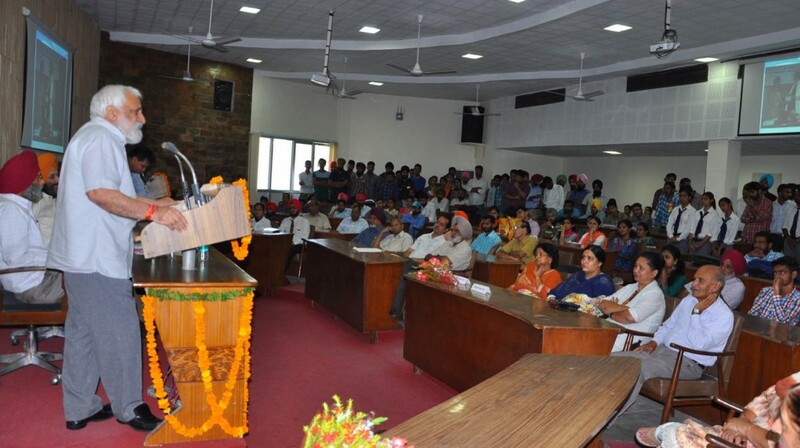 September 5, 2015 in Patiala.